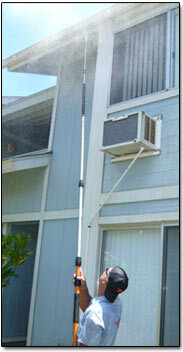 We specialize in washing homes/apartment bdgs, we are the trusted choice for exterior power washing. Mildew and bacteria thrives in humid climates causing health issues. Washing the home can do a lot for "piece of mind" and helping the family remain healthy. The president of the National Assc. of Real Estate appraisers has said that power washing will increase the value of your home from 5%-10%. WHO do we serve? WHAT do we clean? WHERE do we clean? Our services include Full service pressure washing and surface cleaning. We specialize in apartment, condo and home washing, we are the trusted choice for the exterior power washing of multi unit properties in Honolulu, Kailua, Mililani, Kapolei or anywhere on Oahu. Our specialized equipment used along with industry leading advanced techniques make us one of the most efficient and effective service providers on Oahu- helping you and your organization save money and time. Please take your time to look around our site to see what we can offer you and your properties. We Guarantee our work and strive for 100% Customer Satisfaction at all times. We Service all areas on Oahu: Honolulu, Kailua, Kaneohe, Aiea, Makakilo, Kapolei, Pearl city, Mililani, Hawaii-Kai, Waipio, Waipahu, Central Oahu, Leeward Oahu, West Oahu, South Oahu, Waikiki, Daimond Head, Waialua, Haleiwa, Sunset, Laie, Kahuku, Hauula, Liliha, China town, Down town, Ala moana, Kaimuki, Kahala, Hawaii kai, Aina haina, Kaaawa, Punaluu, Wahiawa, Kunia, Salt lake, Pearl harbor, Halawa, Kapalama, Makalapa, Airport, Moanalua, Red hill, Manoa valley, Ewa beach, Koolina, North shore, Waianae, Nanakuli,Kahaluu, Waimanalo.